The modern veterinarian is a highly skilled professional in the field of veterinary care. With an increasing emphasis on high-quality care for pets and other animals, there is a growing demand for veterinarians in all parts of the United States, ranging from large-scale urban vet clinics to small rural veterinary practices. Due to this, veterinary medicine remains a wise choice for individuals interested a career with excellent salary and professional options. A veterinarian or vet is a professional skilled in providing a wide range of medical care to various types of animals. While most people associate veterinarians with pet care, the fact is that vets treat a vast range of animals, ranging from common pets to livestock and even exotic wild animals. In addition, there are a wide range of veterinary specialties, with some vets focusing on narrow fields such as dentistry or cardiology, while other vets remain general practitioners, providing a range of services to those animals under their care. In some cases, a vet may work as part of a larger veterinary care team, while others may work at their own veterinary care practices. Veterinary medicine is a complex field, and becoming a veterinarian requires a large amount of practical and academic experience. In addition, those intending to become a vet must be detail oriented, capable of functioning in an emergency and have excellent communication skills. All veterinary schools require that their students have already graduated from a four-year college before being admitted to the veterinary program. Individuals who are interested in becoming a veterinarian should pick a degree program that focuses on the physical or biological sciences. Secondly, the student should be certain to maintain a high grade point average, preferably above 3.5. This is extremely important, as the admissions process for most veterinary colleges is extremely competitive. It is very important that the candidate ensure that his or her undergraduate institution is accredited by a regional accreditation agency. In most cases, the college itself will have information on its accreditation status, but the student should only attend a college that can prove its current accreditation status, as most veterinary programs will not accept programs from non-accredited institutions. The American Veterinary Medical Association (AVMA) accredits qualified veterinary programs in the United States and other nations alike. By being accredited, a veterinary program is certified as having a high quality faculty, effective training methods and the ability to produce highly skilled veterinarians. Any candidate should make certain that their school has been accredited by the AVMA before they apply. Graduation from an accredited college, usually with a GPA of 3.5 or above. Successful completion of the Graduate Record Examination (GRE). Individual colleges may have differing standards as to what score on the test is needed for admission. Letters of recommendation from the student’s undergraduate faculty. Membership in local animal health and handling organizations, such as the 4-H Club. Volunteer work at a humane shelter, veterinary clinic, or other animal health and welfare organization. Previous professional experience in the field of veterinary medicine. In most cases, it takes approximately four years to complete a veterinary program, depending on the nature of the student’s schedule. Veterinary programs combine academic and practical work in classroom, laboratory and clinical settings. It should be noted that veterinary programs are extremely difficult and require academic discipline to successfully complete. After graduation, some individuals will choose to continue their education, seeking to become certified in one of a number of veterinary specialties. In other cases, the graduate will immediately seek employment as a veterinarian, whether as an employee at a larger organization or as the owner of his or her own veterinary clinic. Taking and successfully passing the North American Veterinary Licensing Examination (NAVLE). 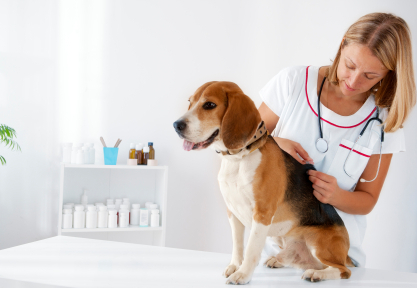 Many states require the veterinarian to take and pass a state jurisprudence exam, which focuses on the interaction of the veterinary field with local state laws. Proof of graduation from an accredited veterinary program. If the veterinarian has previously practiced in another state and remains in good standing with that state’s licensing authority, many states allow licensure by endorsement. This requires that the vet provide proof of his current license to practice in his or her former state of residence. In most cases, a veterinary license will have to be renewed at specific intervals. Most states require that veterinarians take approved continuing education courses to demonstrate that they remain current with modern veterinary practices. The vet should be certain to verify the amount and type of required continuing education courses well in advance of any license renewal deadlines. Currently, the Bureau of Labor Statistics (BLS) estimates that there were over 61,000 practicing vets in the United States in 2010. The BLS predicts a growth rate of 36 percent by 2020, which is far higher than the average growth rate for most US professions. Coupled with the natural attrition from the retirement of older vets, this makes the field of veterinary medicine a very attractive one. In addition, the current median annual salary for vets is over $82,000, making this field extremely competitive with other fields requiring a similar level of education. Some specialties may have considerably higher salaries, especially for new specialties that are currently facing a high demand for qualified veterinarians. This is especially true given the growing emphasis on high-quality pet care. In addition to private practice, there are a wide range of government and private agencies that currently have a need for qualified veterinarians. Zoos, wildlife management programs, public animal control agencies, and humane societies all have a growing need for skilled veterinarians. Other professional opportunities for vets include working in the research field, helping to develop new medical procedures for use on ill or injured animals. Due to this growing demand, the field of veterinary medicine will remain professionally and personally rewarding for the foreseeable future. In addition to the professional benefits, veterinary medicine is a well-regarded field, and its practitioners receive a great deal of respect from their communities. Because of this, veterinary medicine may be an ideal career for individuals who are focused on providing excellent care for America’s animals.